CAFNR Extension includes programs in Agriculture and Natural Resources Extension (below) and Community Development. The College of Agriculture, Food and Natural Resources’ (CAFNR) agriculture and natural resources extension program focuses on economic development, crop and livestock production and marketing systems, and increased income from forages, while balancing the consequences for Missouri’s natural resources and environment. Visit the Extension website for resources, online training and local events. Extension takes the University of Missouri to the people and gives all people access to higher education. 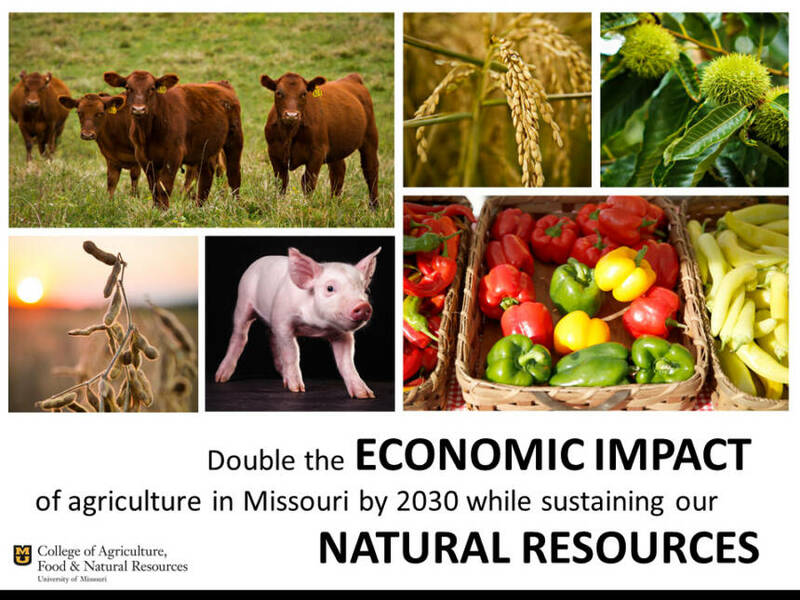 Our goal is to double the economic impact of agriculture in Missouri by 2030 while sustaining our natural resources. More than 2,400 Master Gardeners in approximately 54 chapters throughout the state share gardening know-how and expertise. CAFNR and MU Extension’s Forage Production and Management Program Team use multiple approaches to educate Missouri’s producers to better manage forage resources for improved economic return and to protect the environment. Missouri ranks in the top 10 states in pork production and food processing. MU Extension is a leader in swine research and education. Specialists consult with owners of more than 80 percent of the boars in Missouri. Through the Swine Nutrition, Feed Efficiency and Management Program, independent pork producers realize an estimated average feed savings of approximately $100,000 a year. ANR Programs transfer research results from Ag Research Centers to communities around Missouri. Citizens throughout the entire state benefit from new knowledge and discoveries. The AgrAbility Project offers assistive technologies for farmers with disabilities. About 2,000 Missouri crop producers a year save more than $80 million through better pest control and less pesticide use thanks to MU Exension’s Integrated Pest Management Plant Protection for the 21st Century training programs. The Master Gardener program provides in-depth horticulture training to individuals throughout Missouri who then volunteer their time applying what they have learned to help others in their communities to learn about gardening and environmental education. Extension’s Regional Grazing Schools help farmers learn how to increase the carrying capacity of a farm by 30 percent, improve nutrient distribution and reduce pollution and fertilizer requirements. Missouri ranks second in the nation in beef production, with more than 2 million cattle. The Show-Me Select Replacement Heifer Program improves reproductive efficiency and profits for beef producers. Pasture-Based Dairy Systems: Promotes concepts in economically viable and sustainable forage-based dairy production. Participants acquire skills in financial management, high-quality pasture foraging and animal husbandry. The Missouri Woodland Steward progam helps private land owners identify woodland habitats and introduces basic forest and wildlife management concepts and practices. State Specialists work as subject matter experts. Field Specialists serve as regional educators. County Engagement Specialists represent Extension locally throughout the state.